So as many of you know, I was recently in a bad bike accident. I was headed home from work, coasting down the big hill on the south side of BYU campus. As I neared the bottom of the hill, I went to brake my bike. The front bike cable snapped, and the remaining cable fell on top of my front bike tire. It wedged itself nicely between the tread of the tires. Before I had even realized it, I had flown over the front of my bike, and was flying headfirst towards the concrete. It was a pretty bad day for me, to say the least. I ended up in the hospital with a concussion, about 20 stitches to my face, road rash all along my left side and little memory for several hours. But, through it all, I felt very blessed. Just weeks before my mother had insisted that I purchase a helmet. I have been riding daily for two and a half years without any accidents or a helmet. I had only been wearing a helmet for a small fraction of the time I had been biking when the worst happened. Without it, I probably would have had serious brain damage, or might have died. I think we sometimes have these kind of moments in our lives to remind us of what is most important to us, to reflect on our own mortality and priories. I am thankful to have a wonderful wife, who not only calmly helped me through that difficult day, but who continues to loves me so unconditionally everyday and helps me become a better person. She is so very important to me, and I appreciate her goodness more and more everyday. I am thankful for the blessings of modern medicine, that helped diagnose and treat my injuries. And lastly, I am so blessed to have the Gospel in my life. It gives me perspective and direction when I was again reminded of how fragile a life really is. I know the Gospel is real and it really does bless and comfort each one of us throughout our lives. P.S. 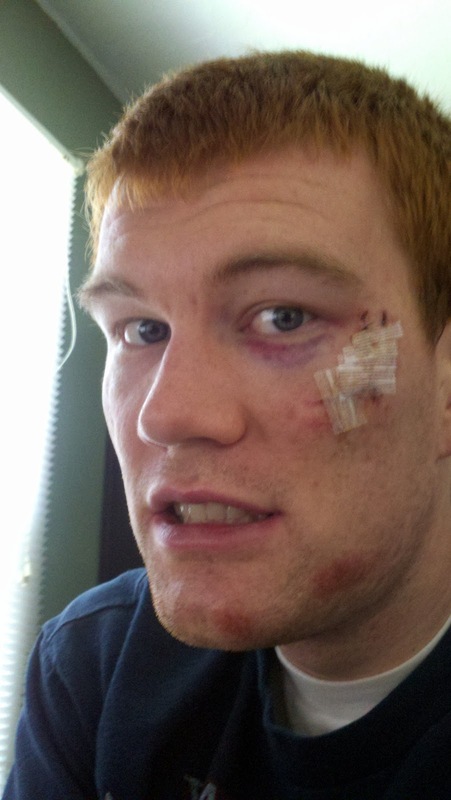 Heres a picture of me the day after, before my blackeye really set in.